A multidisciplinary team of UCLA scientists was able to differentiate metastatic cancer cells from normal cells in patient samples using leading-edge nanotechnology that measures the cells' softness. The study, published Dec. 2 in the advance online edition of the journal Nature Nanotechnology, represents one of the first times researchers have been able to take living cells from cancer patients and apply nanotechnology to analyze them and determine which were cancerous and which were not. The nanoscience measurements may provide a potential new method for detecting cancer — especially in cells from body cavity fluids, where diagnosis using current methods is typically very challenging. The method also may aid in personalizing treatments for patients. When cancer is becoming metastatic or is invading other organs, the diseased cells must travel throughout the body. Because these cells need to enter the bloodstream and maneuver through tight anatomical spaces, they are much more flexible, or softer, than normal cells. These spreading, invading cancer cells can cause a buildup of fluids in body cavities such as the chest and abdomen. But fluid buildup in patients does not always mean cancer cells are present. If the fluid could be quickly and accurately tested for the presence of cancer, oncologists could make better decisions about how aggressive a treatment should be administered or if any treatment is necessary at all. In this study, researchers collected fluid from the chest cavities of patients with lung, breast and pancreatic cancers — a relatively non-invasive procedure. One problem with diagnosing metastatic disease in this setting is that cancer cells and normal cells in body cavity fluids look very similar under an optical microscope, said Jianyu Rao, a researcher at UCLA's Jonsson Cancer Center and one of the study's senior authors. Conventional diagnostic methods fail to detect about 30 percent of cases in which cancer cells are present in the fluid. "We detect cancer cells typically by looking at them under a microscope after the cells are fixed and stained with chemicals, which is really an antiquated method," said Rao, who is also an associate professor of pathology and laboratory medicine at the David Geffen School of Medicine at UCLA. "Usually, the cancer cells have larger nuclei and other subtle features. However, the normal cells from body cavity fluids can look almost identical to cancer cells under an optical microscope. While staining for tumor protein markers could increase diagnostic accuracy, what we were missing was a way to determine if cancer cells have different mechanical properties than normal cells." Employing one of the most valuable tools in the nanotechnology arsenal, the research team used an atomic force microscope (AFM) to measure cell softness. Since the cells being analyzed were less than half the diameter of a human hair, researchers needed a very precise and delicate instrument to measure resistance in the cell membrane, said chemistry and biochemistry professor James Gimzewski, a member of UCLA's California NanoSystems Institute and also one of the study's senior authors. After probing a cell, the AFM assigns a value that represents how soft a cell is based on the resistance encountered. What the team found was that the cancer cells were much softer than the normal cells and that the cancer cells were similarly soft with very little variation in gradation. The normal, healthy cells from the same specimen were much stiffer; in fact, the softness values assigned to each group did not overlap at all, making diagnosis using this nanomechanical measurement easier and more accurate. "It was fascinating to find such striking characteristics between the metastatic cancer cells and normal cells," said Sarah Cross, a UCLA graduate student in chemistry and biochemistry and a study author. "The metastatic cancer cells were extremely soft and easily distinguishable from the normal cells despite similarities in appearance. And we're looking at live cells taken from human patients, so that makes this is a unique finding." "This manuscript is the first that directly shows a relationship between the nanomechanical properties and physiological function in clinical samples from patients with suspected cancer," said Quate, recipient of the 1992 National Medal of Science. "With these findings, it is foreseeable that a combined biochemical, biophysical and morphological analysis for analyzing human cytological specimens using the AFM may be finally realized," said Love, president and medical director of the Susan Love Research Foundation and a clinical professor of surgery at UCLA. The study was a collaboration among the California NanoSystems Institute at UCLA, UCLA's Jonsson Cancer Center, the department of chemistry and biochemistry, and the department pathology and laboratory medicine. In addition to Rao, Gimzewski and Cross, the research team included Yu-Sheng Jin. UCLA's Jonsson Comprehensive Cancer Center comprises about 235 researchers and clinicians engaged in disease research, prevention, detection, control, treatment and education. One of the nation's largest comprehensive cancer centers, the Jonsson Center is dedicated to promoting research and translating basic science into leading-edge clinical studies. In July 2007, the Jonsson Cancer Center was named the best cancer center in California by U.S. News & World Report, a ranking it has held for eight consecutive years. 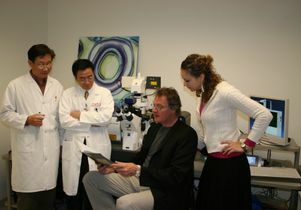 For more information visit the center's Web site at www.cancer.mednet.ucla.edu.